If you are planning a luxury trip to Maui do not miss this offer. 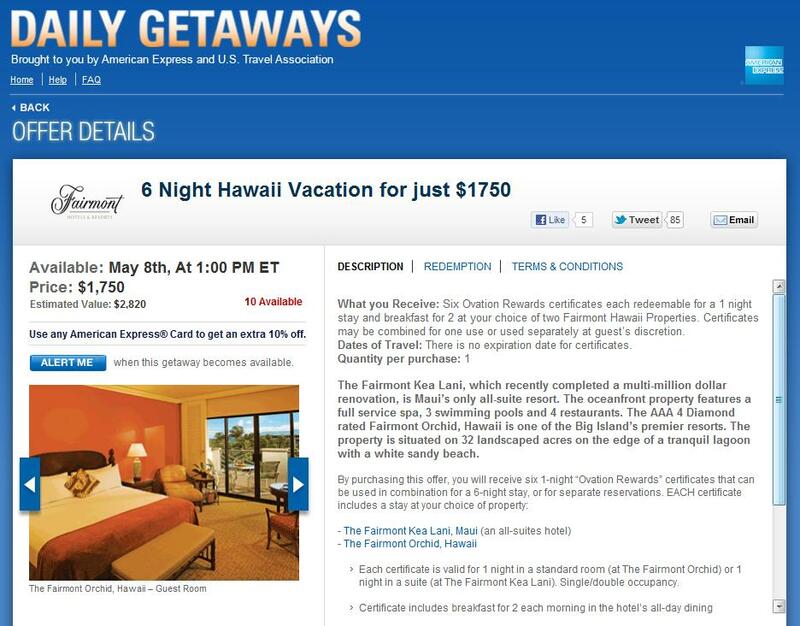 Tomorrow (May 8th) at 1:00pm ET Amex daily getaways is offering 6 nights at the Fairmont Kea Lani or Fairmont Orchid for $1750 or $1600 if you pay with an American Express card. There are NO expiry or blackout dates. Breakfast and all taxes and fees are also included. This works out to $266.67 all in per night for the Kea Lani if you are paying with an Amex card. This is well under half the average rate. During high season such as Christmas or Spring Break I’ve seen their rooms start at $799 a night plus taxes with no breakfast. Here is a recent report I did on the Fairmont Kea Lani, it is an all suite hotel too. If you are planning to take advantage of this deal keep in mind they are only selling 10 packages so I would be at my computer clicking buy right when the deal opens because I think it will sell out fast. This entry was posted in Hotels and tagged Daily Getaways, Fairmont Kea Lani, Fairmont Orchid, Hawaii, Luxury Hotel, Maui. Bookmark the permalink.